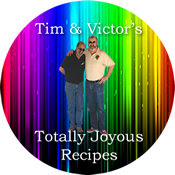 We are ounces away from a fifty-pound weight loss! Un-Flippin’-Believable! Never in my wildest dreams did I see myself 50 pounds lighter. Okay – not entirely true. Only in my wildest dreams did I see it. I never really thought it would – or could – be a reality. It has not been easy – yet, it’s getting easier – even as the workouts get more difficult. It’s all still learning. And… one needs to commit. None of this would have happened if we hadn’t committed to doing it – and actually doing the long-term work instead of trying for a quick fix. It is a lifestyle change, and as much as I miss those nightly ooey-gooey desserts, I’m loving fresh fruit – and really can’t wait for stone-fruits to come into season! It is a trade-off – and one that we’re happily making. It’s time for a celebratory steak! Once upon a time, I’d be grilling two of these huge ol’ things. Today, it’s one – split between us. Still more than enough food – and I often marvel at how much we have cut back while still eating a lot. The concept for the steak came from the NY Times. It’s a grilled strip steak stuffed with a medium-hot chunky pepper sauce. I didn’t have the peppers in the recipe, but I did have a couple of bell peppers and some of our smokin’ hot roasted peppers from our garden. In small saucepan, add oil and flour to make a roux. Add the beef stock, garlic, and oregano and cook until thickened. Stir in the chopped peppers. Set aside to cool. Cut a pocket in the steak making sure not to cut through. Rub with a bit of oil, salt, pepper, and garlic powder. Spoon about half of pepper mixture into steaks and secure with toothpick. Reserve remaining for topping. Heat reserved pepper sauce and spoon over steaks. The potatoes were a concoction I got from the BBC food section. It’s a fun site – and anyone can access! I peruse a lot of the BBC/British food sites and am getting quite adept at metric conversions and British terminology. Like delving into La Cucina Italiana – in Italian – it’s a great way to connect with different cultures. And if you think our politics are screwed up, try following Brexit in the British papers! Mary’s recipe calls for parmesan. I used a great Piave. It was perfection! I also made like a third of this recipe but still used a lot of cheese. Preheat the oven to 200C/400F/ (180 fan). Butter the serving dish.